The Greater Bandon Association has named the July recipient of its Volunteer of the Month award. John Towne becomes the ninth winner of the second year of this award created in 2016. 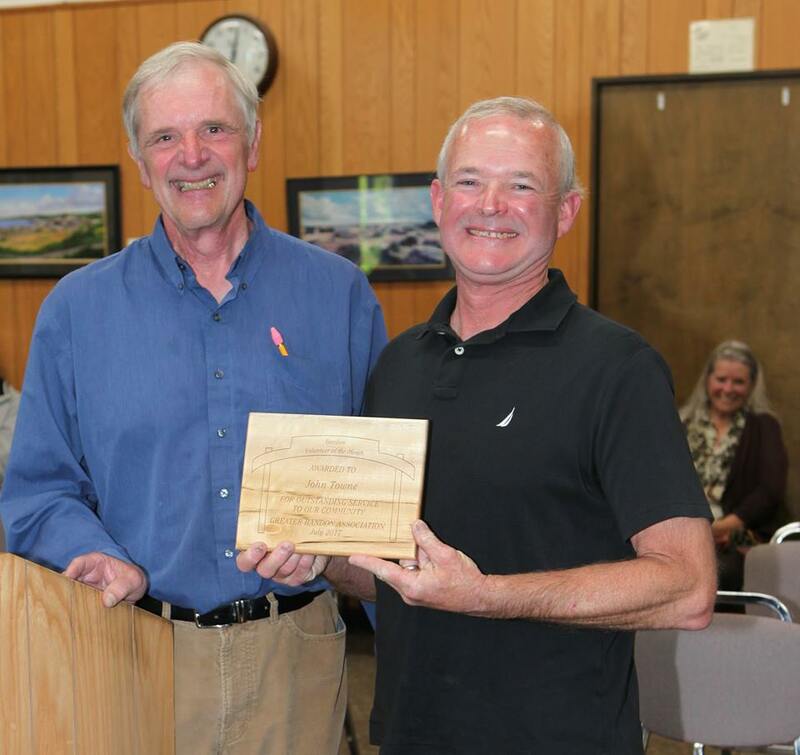 John was presented the award in the form of a plaque and a gift certificate from The Loft at the July 10th, 2017 meeting of Bandon’s City Council. John was nominated by multiple members of our community this month, …likely due to the fact that he has been instrumental in making so many projects happen over the years. In addition to the many hours that John and his wife, Peggi, put in to make the Old Town Marketplace a hub of activity with music, food, and crafts, John is also involved in the Good Earth Community Garden, Bandon Community Youth Center, and the Gorse Blossom Festival (just to name a few!). Some of his accomplishments include: starting the annual community garden plant sale fundraiser (and donating 250 plants each year! ), designing and building the 8th street walking path, and building garden beds, fencing, and a greenhouse for the youth center. John was also a huge asset to the inaugural Gorse Blossom Festival taking on the giant task of managing trash and helping out with the kitchen. And, luckily John does it all with a smile. Fellow volunteers at the community garden said, “When we think about John, we think about the happiness he exudes, his energy, his kindness, his absolute pleasure he shows while working in the Garden. He always has a big smile”. I think one of our nominees sums up John’s impact on our community perfectly by saying, “I think of John as the one man in town I can call if I need help with anything at all.” He’s the kind of person who’s willing to do anything and everything for the city he loves. Thanks for keeping us all smiling and motivated, John! The Greater Bandon Association will be honoring one of Bandon’s many volunteers that are making a difference in the community each month. Nominations for the August award should be e-mailed to harv@greaterbandon.org or mailed to P.O. Box 161 by close of business on July 28th.